It has been long established by medical science that optimal immune system function is important for overall health. Unfortunately, the immune system ages just like the rest of our body. Over time the thymus gland atrophies and produces lower levels of critical thymic proteins required by the immune system to support an effective immune response. ProBoost® was developed to meet this thymus shortfall. 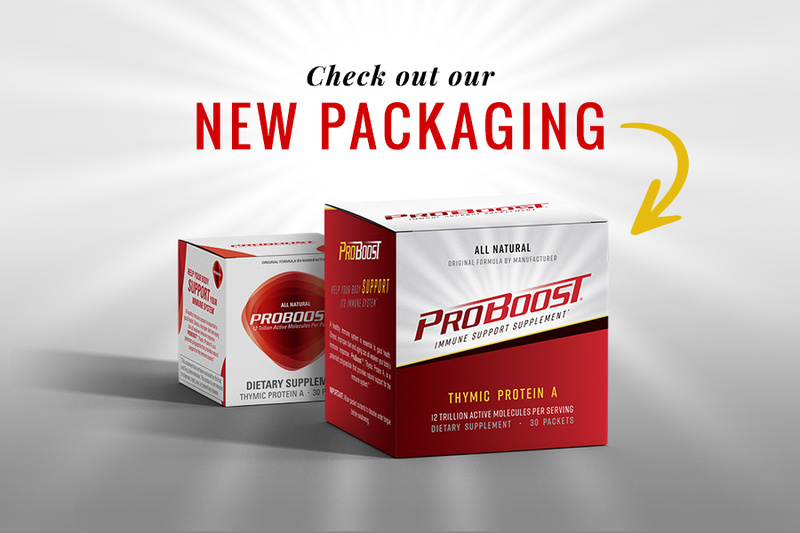 Thymic Protein A, the active ingredient in ProBoost®, has the same biological activity as a key natural thymic protein produced in the body. Thymic Protein A has been determined by the National Institute of Health to be a potent immunoregulator by inducing interleukin-2 production. Increases in white blood cell counts. Vital in maintaining health. Increases in T-cell (helper cell) levels. Critical in helping the immune system respond quickly and effectively. Induces apoptosis (cell death). An important defense mechanism against aberrant cells.